We here at Animefringe have been keeping our finger on the pulse of an unexplained phenomenon concerning mysterious flying monsters that have been appearing around the world at an increasing rate over the past few years, dubbed "Shadow Dragons." The first official Japanese source stating the existence of an oddly-shaped Unidentified Flying Object matching the description of a Shadow Dragon was an otherwise routine Japanese Air Force maneuvers mission report from the year 1985. Hidden among the mundane checklists and mission logs in this document is a report of a bogey pulling a "cobra" at six hundred knots. Two fighter jets, code-named Guinness One and Bulldog, attempted to tail the bogey until the object flew below "Angels 3" and splashed down into the ocean. The report does not mention any further details. In early 1998, the now-famous 'Motoki Incident' blew the whole Shadow Dragon conspiracy wide open -- when a small carrier airplane was allegedly attacked by two warring aerial creatures over the waters near Ogasawara. The creatures are assumed to be Shadow Dragons. The incident brought worldwide exposure as reporters flooded the Japanese province where the plane was brought down safely, minus two passengers. The missing passengers resulted in a wide-spread investigation by Japan's Ministry of Transportation as well as the Police. On March 28, 2000, Japan's Ministry of Transportation released a report, stating that a 18 by 8-foot section of the plane's fuselage was missing. The missing portion housed vital cable connections which were severed, causing the rudder and wing elevators to cease functioning. Luckily, the cabin depressurization that occurred as a result of the fuselage damage did not rip the plane apart. Yet the whereabouts of the two missing male passengers is still currently unknown. Adding more mystery to the situation is the fact that the names and addresses that the passengers gave at boarding were false. Animefringe has personally learned that after the incident, all personnel on duty at both the departing and destination airports were thoroughly questioned about the damage to the plane and the missing passengers. The co-pilot, Mr. Kura's testimony literally brought the investigation to a new plateau, and the pilot, Mr. Suzuki, and surviving passenger, Shiina Tamai, had to be questioned a second time. In Mr. Kura's testimony, he alleges that there was "a monster and a naked girl" outside of the plane as well as a beast that he claimed looked like a flying squid. These descriptions, however vague, are consistent with descriptions of the 'Adult Shadow Dragon' and the 'Push Dagger,' as is the mention of a naked girl whose description seems to bear resemblance to the seldom-reported 'Virgin Princess.' But never before have three different types of Shadow Dragons been reported at the same time, in the same place. Extensive investigation of this case has lead many Shadow Dragon researchers to come to the conclusion that there are rival groups of Shadow Dragons. Kozo: "Shiina, my name is Detective Kozo. I realize that you had to answer a lot of questions when you first landed concerning your flight's problems. But, after speaking with co-pilot Auka, we've got some more questions to ask." Kozo: "Good. Mr. Auka gave us some... interesting clues, about monsters and such. Can you elaborate on what happened again, when the plane was damaged?" Shiina: "Well, after we were hit I went to check on the two passengers and to see what had happened. They were still in their seats, so I went into the tail section." Kozo: "Can you describe these two passengers?" Shiina: "Uh... they where two guys. One was pretty good looking and was really nice, and the other one looked like a girl, but was really a really mean guy with a bad attitude. I hope they're ok. Why do you ask?" Kozo: "Well, the names and addresses they gave at boarding were false, so we can't obtain any further information on them." Shiina: "That is so weird!" Kozo: "Since it's obvious there was no way they could have been 'pulled out' of the plane, do you have any idea what could have happened to them?" Kozo: "Ok. What did you find in the fuselage?" Kozo: "Did you see anything else out of the ordinary?" Kozo: "And what did you do after that?" Shiina: "I went out of the cargo bay and hid in the bathroom. So I didn't see anything until we landed." Kozo: "What did the flying object look like that was seen before the damage occurred?" Shiina: "Er... it was kind of blurry when I was in the cockpit with Suzuki and Auka... But from what I saw, it looked like a weird plane, but it had an eye on it. It's kind of hard to describe." Kozo: "Mr. Auka claimed it resembled a flying squid. Interesting." Shiina: "Well, that's what you get for listening to Auka. [laughing]"
Kozo: "Figured as much. That's an interesting backpack you have there, where did you get it?" Shiina: "Huh? Oh, I got it on my trip to Ogasawara to visit my grandparents. Ain't it cool?" Shiina: "Yeah! What kind of sports are you into?" Shiina: "You know... swimming, judo, sword baton, baseball..."
Kozo: "Oh! I'm lucky if I even can find the time to eat a decent meal." Shiina: "You sound like my Dad. He probably ate nothin' but junk food while I was gone." Kozo: "Sounds like my life..."
Shiina: "You should really take better care of yourself. Sports are so much fun. I get up at six each morning to exercise with a program on the radio." Kozo: "I'm usually still in bed long past that time." Kozo: "Probably so. [laughing] Well, it's getting late and I'm all done with my questioning now. You are free to leave if you wish." A large bulky creature that glides on air currents and can perform near-impossible aerial maneuvers with precision. Recent pictures depict the Adult Shadow Dragon with the Virgin Princess. A humanoid being seen with Adult Shadow Dragon that has distinctive circular lines and shapes on its body. A squid-like Shadow Dragon that is thin from front/top, yet plane-sized from side, hence it looks like a dagger. Often sighted before aircraft crashes. Starfish-like creatures that were reported occasionally in alien abductions. They gained market appeal with a company introduced a line of products based on them. Researchers have theorized that certain periods of increased Shadow Dragon sightings occur before times of great misfortune. A force dubbed Black 1 is believed to be in control of Shadow Dragon activity. In May of 1998, manga creator Mohiro Kitoh, also known for his award-winning manga Vandimiel no Tsubasa (January 1996-February 1998) and the Internet-only manga SiNNa 1905 (June 1999), launched a new series in Afternoon magazine called Narutaru. Making the series an unrelated extension of his other works, he crafted a series that, at first glance, appears to be a very innocent and touching story about a young girl who befriends a round starfish creature, who she names Hoshimaru. But below the surface, it expresses an encompassing story that could go in any direction, as rival alien factions battle for supremacy and the future of the Earth hangs in the balance. As one truth is uncovered, it leads only to greater mysteries. This epic plot, coupled with naturally flowing characters, are just some of the many reasons for the series' long success which it still enjoys to this day. Narutaru has now been exported from Japan and renamed Shadow Star by Dark Horse Comics, one of the leading publishers of English translated manga, and wonderfully translated by Dana Lewis and Toren Smith of Studio Proteus, with excellent lettering and touch-up by Pat Duke and Radio Comix. With all that great talent at the helm of Shadow Star, it has become a welcome addition to Dark Horse Comics' manga anthology magazine, Super Manga Blast! alongside Seraphic Feather, 3x3 Eyes, Where's Michael?, and early episodes of Oh My Goddess!. Shunji works in a management/pilot position for Motoki Air Service and often must work long hours making sure everything runs as it should. When he was younger, he left his home on a remote island to join the Japanese Air Force, where he became a defense pilot and has had several run-ins with Shadow Dragons. As a young boy he liked to draw, but nowadays he has developed a lazy disposition and lets Shiina take care of them. His wife, Misono Tamai, is currently away teaching at a university and conducting fundamental research at a science laboratory. Komori is a 14 year-old with a thing for matte hats and knives. Together with his ‘Push Dagger' Shadow Dragon, they go to any extreme to get the answers they want, at whatever the cost. Komori has no remorse for his actions and thus he is extremely dangerous. Unlike Shiina and Akira, Komori seems to be on a mission to destroy the other Shadow Dragons instead of work together in cooperation. His motivations seem cloudy at times. Shadow Star © 2000 Mohiro Kitoh. All rights reserved. 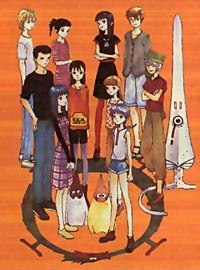 Originally published in Japan in 1998 by Kodansha Ltd., Tokyo. English-language edition copyright © 2000 Studio Proteus and Dark Horse Comics, Inc.